Since when were these words owned by the left? Some of the greatest reformers of the modern era have come from the right. Yet I have had numerous people in public life tell me that conservatives now eschew these words for fear of being slurred as a “bleeding heart”. Today, the legacy of this abdication is material. And abominable. It might be just a matter of academic interest were we not being accused of trashing basic human rights – of protection, dignity, access to medical care and education for refugees held in offshore detention – while also witnessing documented evidence of mistreatment dismissed as partisan nonsense. Even sadder still is the fact that children are at the core of this dispute. We saw their faces on a powerful, wrenching Four Corners on Monday night. The show detailed the plight of children stuck in indefinite detention on Nauru – beautiful, thoughtful faces, soberly reflecting on trauma, depression, loss of dreams, sexual assault and their longing for a decent education. Many felt physically sickened watching it, including me. Then there were the troubled faces of teachers and social workers – generally decent people happy to work in substandard conditions for little pay because they want to help those who sorely need it – and who are risking fines or jail terms because they are speaking publicly about what they have seen. 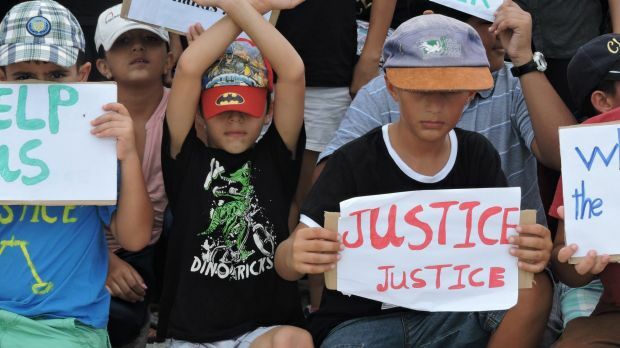 Journalists have been largely denied access to the island of Nauru. But for still trying to report on conditions there, they too are slammed as activists, criticised for telling stories the government does not want us to tell instead of just, say, running official, sanitised footage. I will leave others to defend the merits of carefully reported investigative journalism in which no errors were found. But what a grim state of affairs it is when we vilify and stereotype people who care for homeless children as marauding activists, intent on twisting truths to achieve their secret, twisted agenda of … caring for children. It’s nonsense to suggest these critics are partisan: both major political parties are culpable. We all are, to some degree. But don’t we all agree children deserve protection? We did in 2005 when the Migration Act was amended to allow children to leave mainland detention. This week, facing a High Court challenge about the legality of the secrecy provisions of the Border Force Act, the government backed down on the silencing of doctors and medical staff who want to talk about conditions on Nauru: a significant, much welcomed move. This may lead to more worrying stories emerging. But it should be noted that detention staff and teachers are still not exempt. What is odd is that this is all happening when Australia has applied for a seat on the UN Human Rights Council, and can expect greater scrutiny of our own abuses, which the UN has already fiercely condemned. This isn’t partisan. This is about a corrosion of the principle of collective care, of moral responsibility, in which we are all culpable and far too apathetic about. On Thursday The New York Times, calling the indefinite detaining of refugees offshore a “disgrace”, called on the UN to “redouble its efforts” to resettle those people offshore, and pressure Australia to change its policy. Cue sneering at The New York Times. Cue “activist” eye-rolling. By their silencing and slandering of professionals who have worked on, or are reporting about, Nauru, the secretive government has created the conditions in which we must demand more information. Even a whiff of abuse or neglect should surely demand urgent investigation. Even within the parameters of offshore detention, we must urgently seek to know, and be reassured, that those who are there have access to education, decent medical care and are not being raped or assaulted. It is intellectually insulting and morally fraught to call anyone concerned with basic rights an “activist”. Julia Baird is the host of The Drum on ABC TV.